More power, more comfort, more safety. 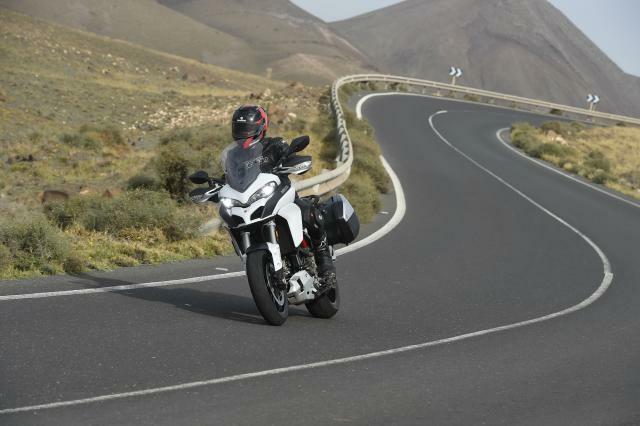 Is there a better all-rounder than the 2015 Ducati Multistrada 1200? FACT: no one knows exactly what an adventure bike is. 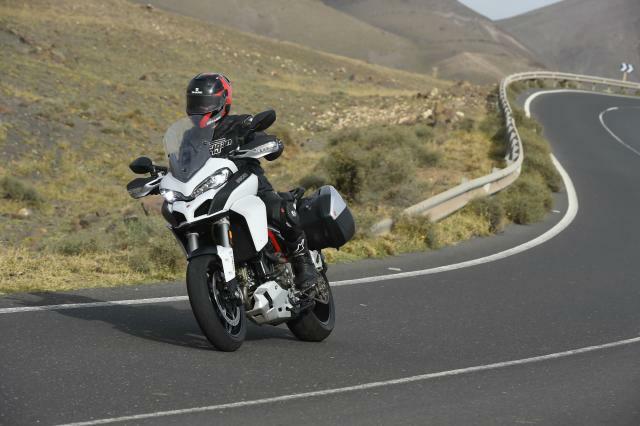 Or perhaps it would better to say that everyone knows 'adventure bike' doesn't really mean much: an all-encompassing term for anything middleweight or above with longer-than-average legs. 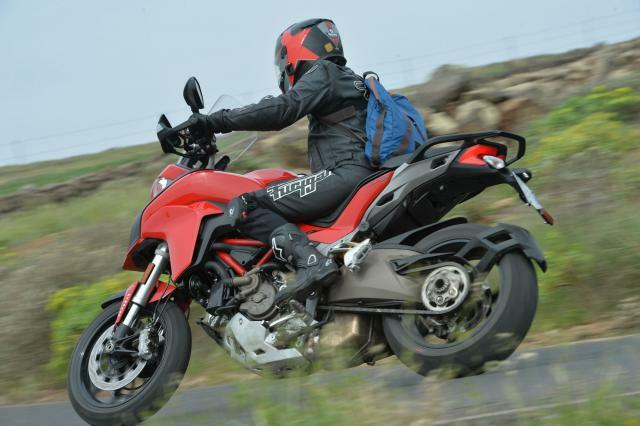 Some of the blame for the muddle must lie with Ducati's Multistrada 1200. 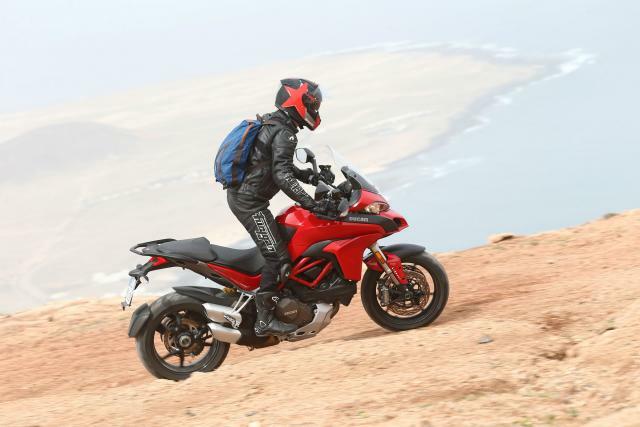 Launched in 2010, its first adventure was one across the boundaries of motorcycle class. 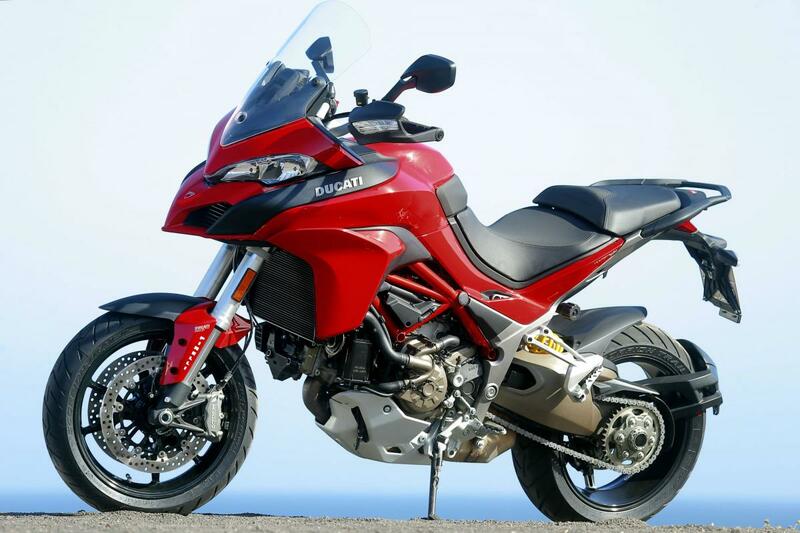 It was an adventure bike to seduce sports bike riders, promising 150hp, brutish torque and sharp handling, but also comfort. A superb if slightly unhinged all-round road bike, with advanced gadgetry including traction control and riding modes. A long-legged, high-performance sports tourer. Call it what you want, but know it was more than just another adventure bike. It's matured a bit since then. In 2013 it got a round of civilising refinements, including subtler traction control and more advanced ABS. The 'S' edition also got Ducati's semi-active 'Skyhook' suspension, so-called because the stability it provides is supposedly as if it were suspended from above. 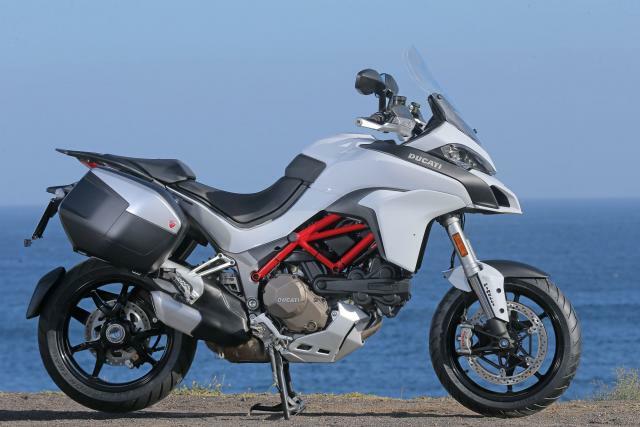 Now, for 2015, it's had another round of updates, this time so extensive that it's in fact '100% new in technology and componentry' according to Ducati. The frame, sub-frame, engine, fork, shock, brakes – all new, the firm says. It's gained variable valve timing, or Desmodromic Variable Timing as Ducati calls it, a production bike first according to the Italian manufacturer. It means independent control of intake and exhaust camshafts, which is said to optimise performance throughout the range. 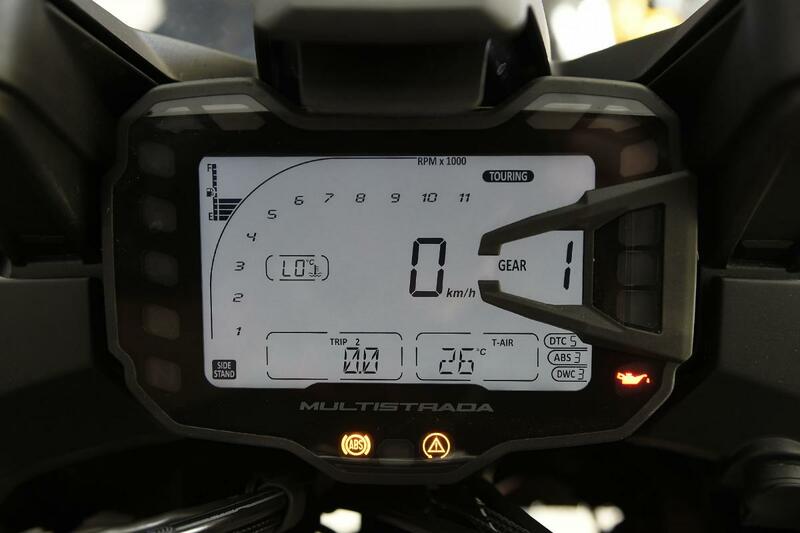 It's got new electronics, with an Inertial Measurement Unit, or IMU, like Yamaha's new R1, measuring roll, pitch and yaw. For the Skyhook semi-active suspension, that means it now knows whether the bike is leaning over in a corner, and can optimise damping accordingly. 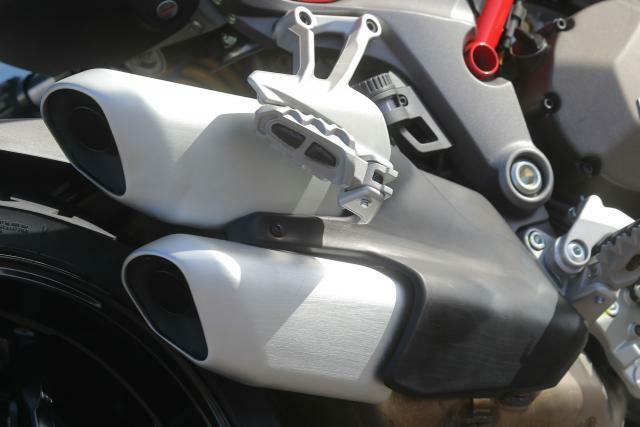 We also have the IMU to thank for a new Ducati Wheelie Control system, or DWC. 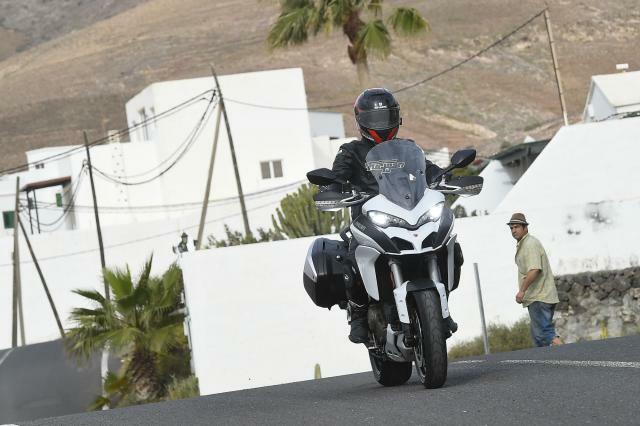 I rode both the Multistrada 1200 S and the base edition Multistrada 1200 at the press launch in Lanzarote today. 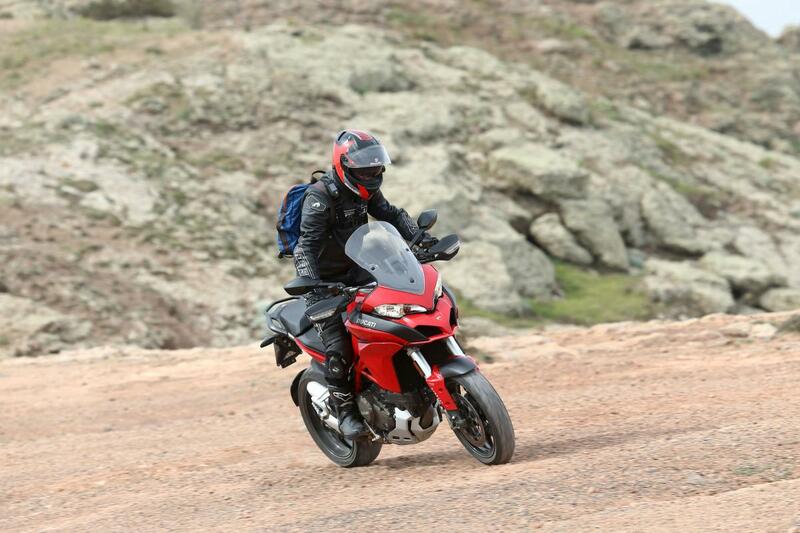 Both have four riding modes – Sport, Touring, Urban and Enduro. The former two give you the full 160hp and the latter only 100. Each mode provides different levels of intervention from the ABS and traction and wheelie control. Only the 1200 S, with Skyhook, also provides different semi-active suspension behaviour in each of the four modes. At a stand-still in Touring mode, and at low speed, the S feels soft, both ends compressing easily, but things change as speed rises, the back firming up. Forward pitch under braking is inhibited as the damping adapts. It still pitches but not as much as it otherwise would, something that became very clear when I later tried the base edition. 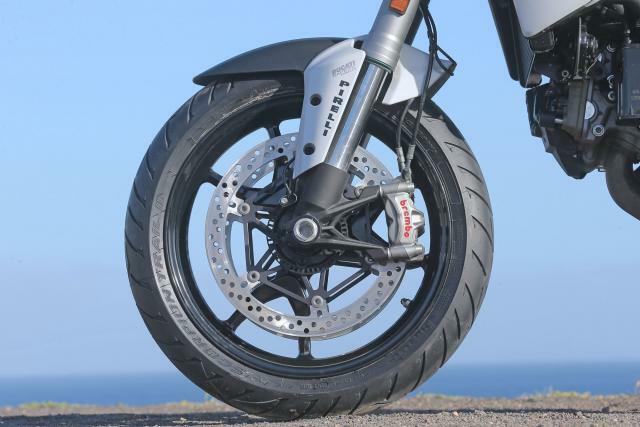 It uses a capable fully adjustable Sachs shock and 48mm upside-down fork, the same as the 1200 S, but without the semi-active adjustment it pitches more. Switching from Touring to Sport on the S edition had an immediate tautening effect but it seemed to soften when appropriate, retaining a level of comfort at a constant speed. The new Multistrada 1200 makes 10hp more than the old one, at a claimed 160hp. Torque has risen from 91.8lbft to a startling 100.3lbft. That's 1.5lbft more than Kawasaki's new supercharged Ninja H2. 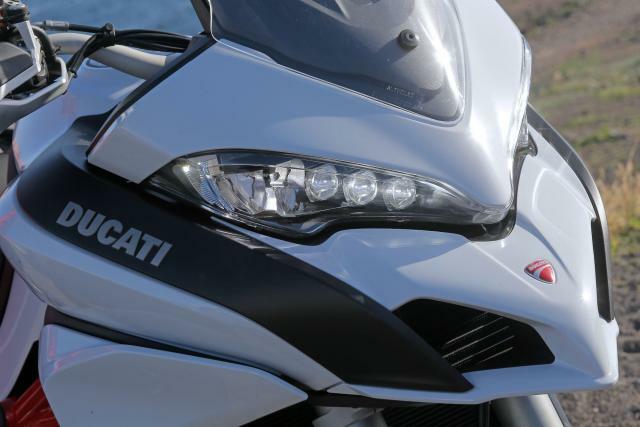 Across a wide range of engine speed, power is up 7% and torque 9%, according to Ducati. It's got more of everything everywhere. 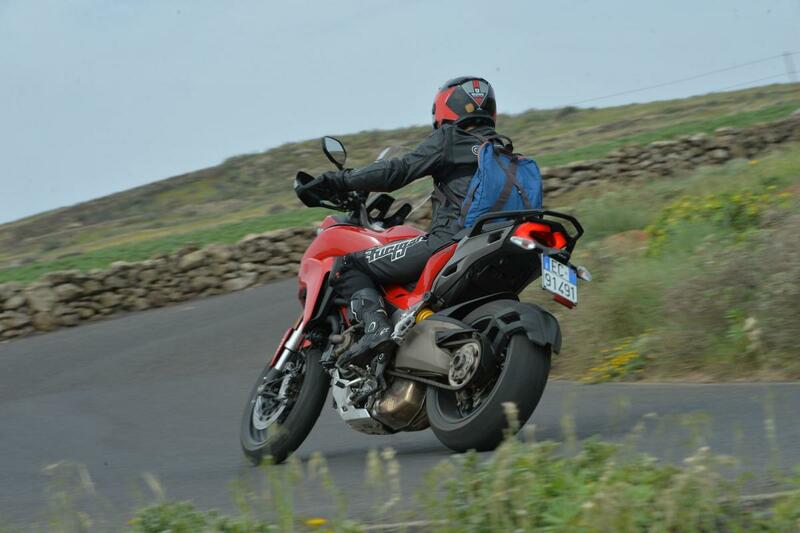 The Multistrada is even faster than it seems - and it seems fast. A few seconds is all it takes to add another 40, 50, 60mph. Because it's comfortable, with that tall screen, and not stressed or vibey, it doesn't feel like you're going that fast. Until you see another vehicle on the horizon and realise how quickly you're gaining on it. 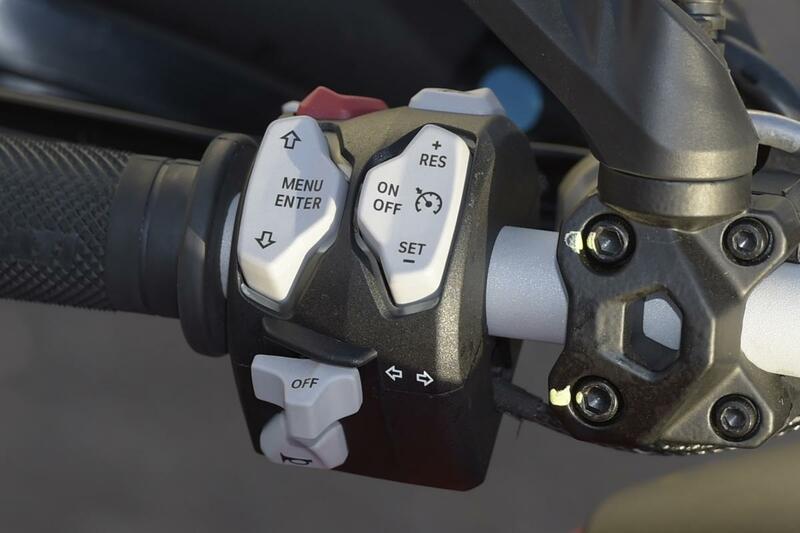 The screen is adjustable by 60mm, using the same one-handed 'pinch and slide' mechanism as the old Multistrada. It's really easy to do on the move. At its highest setting the screen is above chin-level for the average-height male. Each riding mode gives a different throttle response. Urban feels like a different engine, with much less power for a given amount of wrist twist. In Sport it's another animal. Open the throttle – and it's difficult not to – and the V-twin note immediately becomes an induction roar. 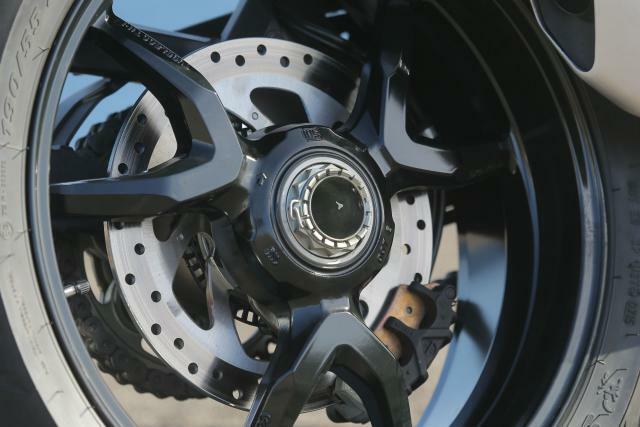 The front wants to pop up above 5,000rpm in first and second and, with the wheelie control in a lower setting, it will. Change up and the front skips on the tarmac again, the bars doing a tiny shake from side-side. Touring mode offers a noticeably gentler throttle response and you more frequently see lights on the dash flashing to indicate intervention from the wheelie or traction control. The actual intervention is very subtle. Not a sudden cut in power, just a little hesitation or two, barely perceptible. It's possible to alter the pre-settings in each of the modes, changing the intervention from ABS, wheelie and traction control. Wheelie and traction control can also be switched off. Theoretically (and Ducati said) the DWC makes wheelies 'safe'. It monitors acceleration and pitch angle, with eight intervention settings. The lower the setting, the later it will bring the wheel down. Short-shift to stay around 5,000-7,000rpm and you'll have plenty of drive and fun between corners on twisty roads. A sniff of a longer straight and it's difficult to resist stretching the Multistrada's legs to the 10,000rpm red line. 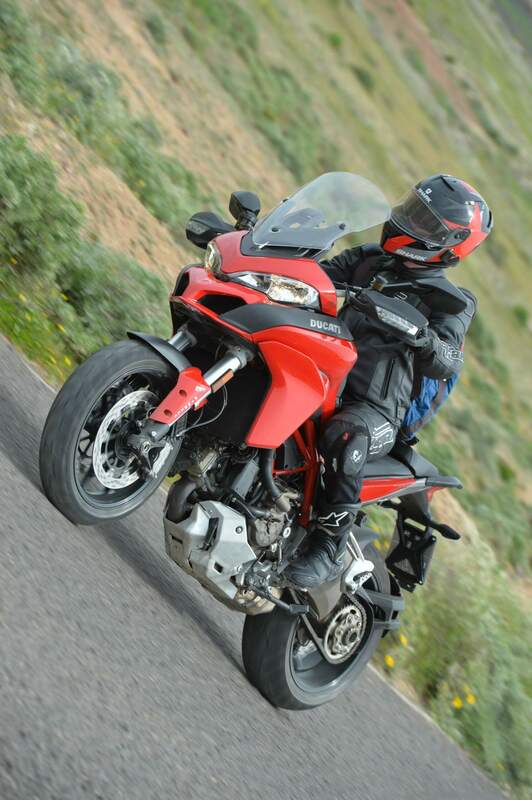 The Multistrada may deliver loads more than average power but it's power that a decidedly average rider like myself can easily use. It makes an easy job of going fast. It's also really confidence-inspiring in bends. Perhaps the most significant benefit of the IMU is the addition of cornering ABS as standard equipment on both versions of the Multistrada. Any mention of cornering ABS seems to divide opinion on Visordown. Taking the skill out of riding, someone will say. I'm not a huge devotee of electronics myself. I'd still happily buy a non-ABS bike to save some money. But I can tell you this: cornering ABS is amazing. The most significant development I think I've seen on a motorcycle. Where other things have improved motorcycling, this has changed it. It almost seems to change physics. I have no doubt it will prevent crashes. 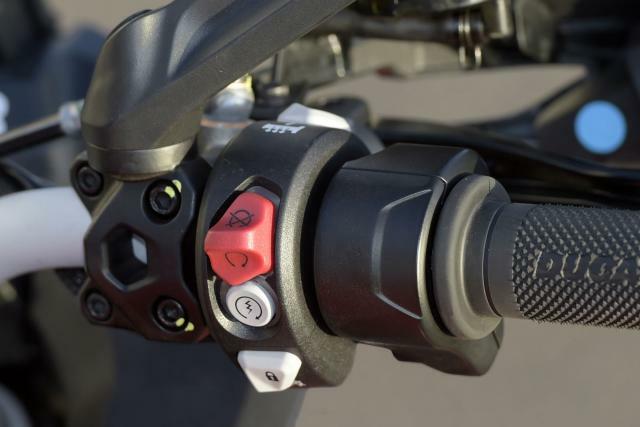 Ducati uses a similar Bosch-developed system to KTM's 1190 Adventure and 1290 Super Adventure, which lets you grab a handful of brake mid-corner without losing the front or going straight on. Instead the bike just stops without changing trajectory. Whether you ever have to use it or not, it's nice to know it's there. 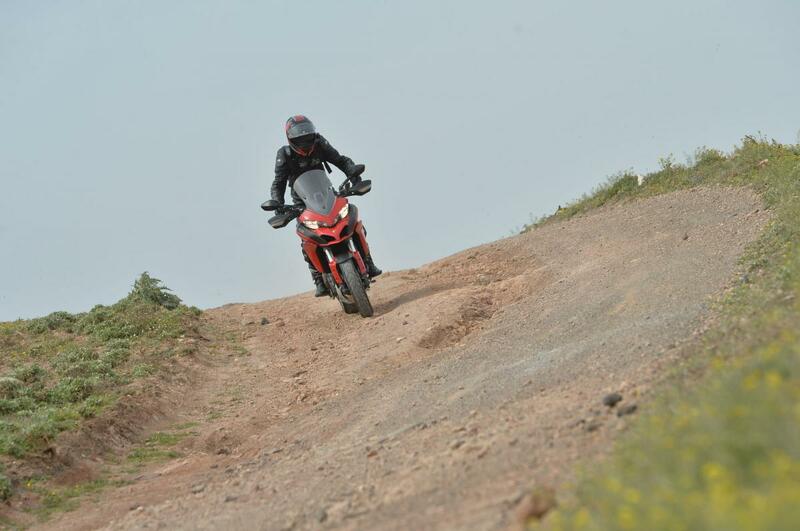 KTM's system allows the traction control to adapt to lean angle too. Ducati's isn't that sophisticated; the traction control and IMU are not integrated. 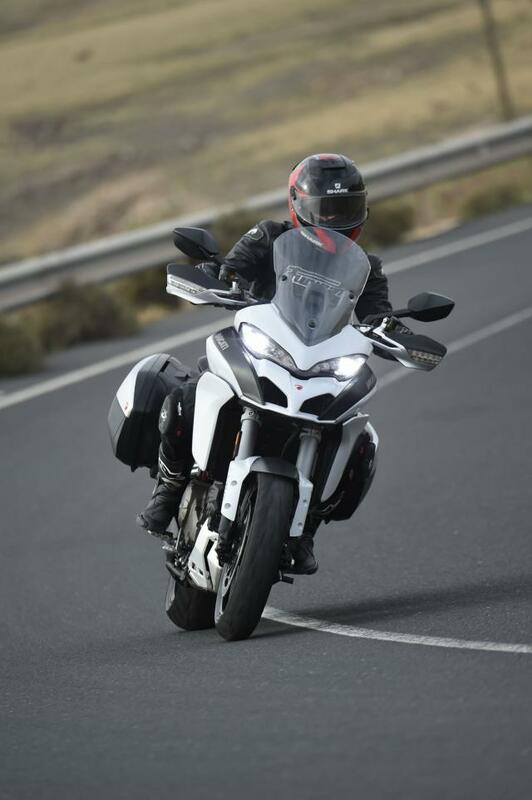 The Multistrada now has a full LED headlight, where the old one only had an LED low beam. The S edition gets 'Ducati Cornering Lights', which use additional LEDs and the IMU to broaden the beam on one or other side in corners, so you can see where you're heading better. The launch ride was entirely in daylight, so I have no idea whether they are effective. The other differences between the S and base model are in the clocks and front brake. The 1200 has a black-on-grey digital dash, while 1200 S has a colour one. 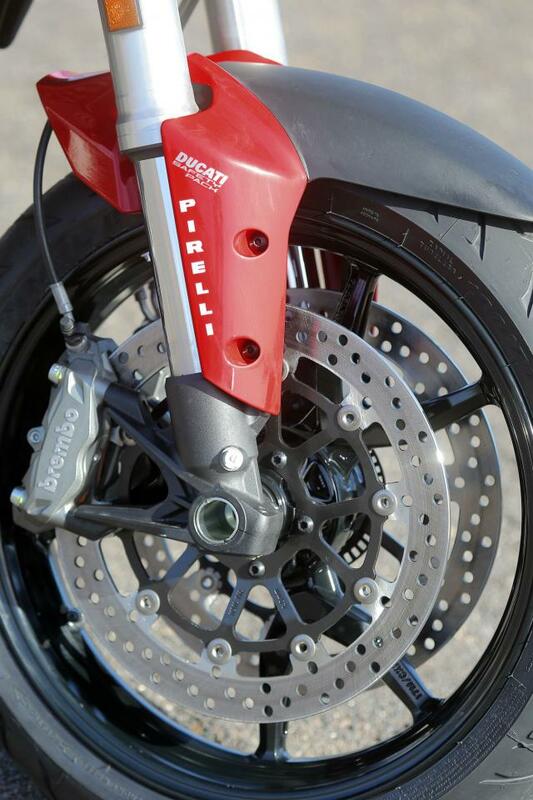 The front brake on the S uses the same 330mm discs and radially mounted four-piston monobloc Bremo calipers as the Panigale 899. The base edition has slightly lower-spec calipers, but still radially mounted Brembo monoblocs, and slightly smaller 320mm discs. Both have loads of power. Service intervals have increased, to 18,000 miles for a valve-clearance check and 9,000 for an oil change. 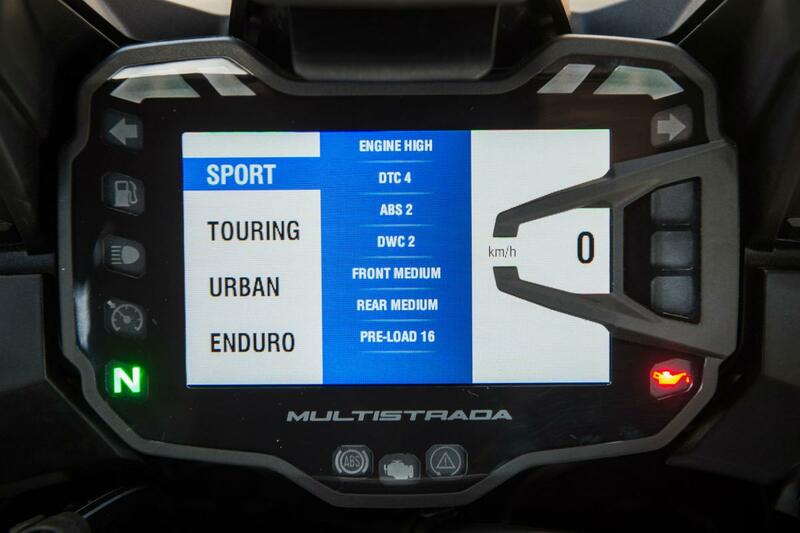 Since the launch of the original Multistrada, Ducati's marketing line has been that it's four bikes in one: A tourer, sports bike, urban bike and enduro bike. The new version comes with four corresponding accessory packs. So there's a touring pack including heated grips and panniers (fitted to the 'S' edition I rode), a sports pack with a Termignoni carbon exhaust, an urban pack with a top box, and so on. I accept that it's three bikes in one, or what you might call a 'versatile motorcycle'. It is a great tourer, with a power socket and now cruise control as standard on all versions. 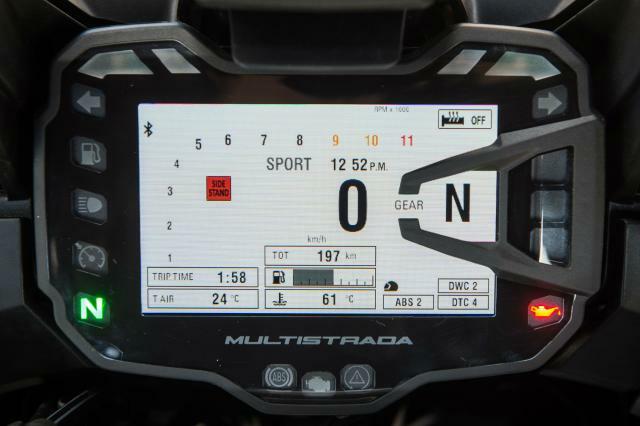 There's more room for rider and pillion according to Ducati, and better wind protection from that higher screen. It is a great urban bike, with the steering lock increased by 4° (to 80° ) for easier U-turns. 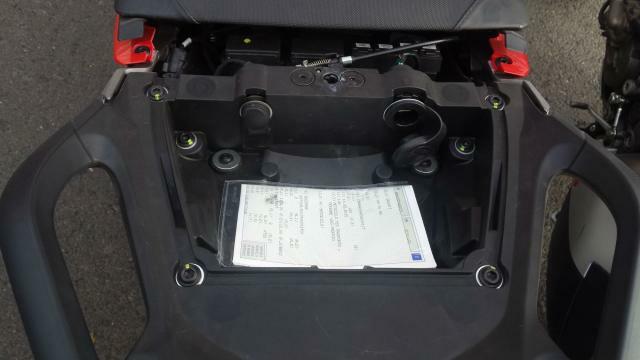 The seat has been lowered slightly, and is adjustable from 845mm to 825mm, using tools. I'm a relative shorty at 5'9” and felt no need to lower it from the higher setting. There's a good space under the pillion seat for a disc lock. 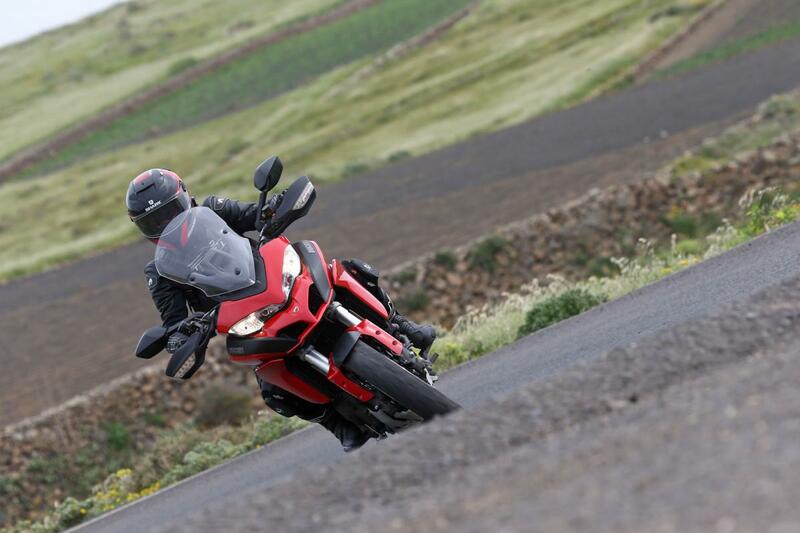 The Multistrada is a great sports bike too, a comfy one. By I don't buy the enduro. The launch ride included all of about 200 yards of gentle trail riding, purely for photographs. I could have done it just as well on my SV650. I'd go as far as asserting that no one buys a Multistrada to even put a toe off road. Am I wrong? Send an email to iamtheonlyone@visordown.com. 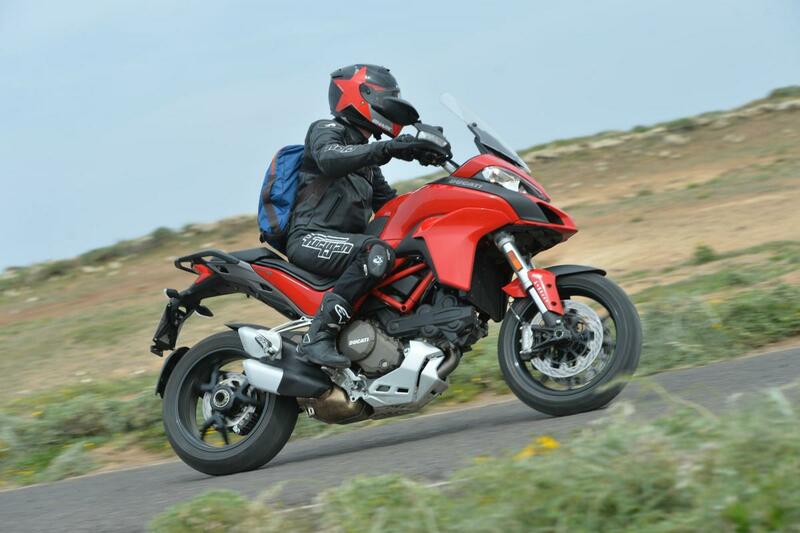 So I wish Ducati would dispense with that claim, and the pretence of the Pirelli Scorpion Trail II tyres (although they are capable on the road), and celebrate what the Multistrada 1200 is: one of the most exhilarating, versatile and safe road bikes you can buy.